These come rigged right out of the package on a 15lb leader with a custom made blade that cause a very unique spinning action on the fly and #2 silver double stack hooks. These flies works exceptionally well when pulled 12"-24" behind a dodger/flasher for kokanee, trout and coho. Stand Back- Unless you want to catch some fish? The Dynamite Fly has rapidly gained wide-scale use as a safer alternative to gun powder and nitroglycerin. The Flame Orange Fly is the ticket when you need BRIGHT Colors!! The combination of three colors, holographic purple, UV pink and translucent orange is the ticket for the big fish to see. This is a must have in your line up when heading out the door to your favorite fishing spot. The colors of chrome sparkle fish scale and orange crush UV will make it easy for you to catch a nice fish! Don't under estimate this orange uv color, it is a buffet for fish. This is a must have in your line up, when heading out the door to your favorite fishing spot. The combination of chrome and pink UV this is sure to give you some tight lines. Don't let the simple look of this fly fool you! The Pondery Fly has put a lot of nice fish in my boat! We use a clear blue tint for this fly and it defiantly catches the fishes attention! This fly looks like live bait fish swimming in and erratic action. When you put this fly in the water it turns a bright blue almost as if it was electrified. This is a must have in your line up when heading out the door to your favorite fishing spot.The colors of chrome and purple with a little bit of UV will make it easy for you to catch a nice fish! The sushi fly has quickly became one of our top seller flies. Sushi is tied together with our famous pink uv material and a transparent orange and little silver sparkle. The fish love it and so will you! 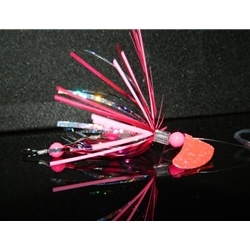 The Valentine Fly is made of three separate colors Chrome, Fuchsia and Pink UV. This is a very hot fly! The Valentine fly makes it easy to catch kokanee and take them home and cook them up on the grill.